You’ve finally decided to rip out the carpeting throughout your home and install hardwood floors instead. You’re ready for the look and feel of hardwoods throughout, and can’t wait to have them installed. There are many ways you can go about it. You can do it yourself. You can hire a friend of a friend. You can find a coupon and get a great deal. These ways can all work well … or be a complete disaster. Laying hardwood flooring isn’t rocket science. But if you don’t do it correctly, the results can be bad. Unless you are very confident in your DIY skills, you probably shouldn’t install solid hardwood floors yourself. There is a lot to know to ensure a quality installation, once that will last you years, even decades into the future. But hiring isn’t as easy as saying yes to the first person you meet. Hire the wrong contractor and it can be just as bad as doing it yourself. How do you know you’ve hired a great flooring contractor? Did you know a reputable flooring company uses quotes as legal and binding contracts? All reputable flooring companies will have you sign it before they ever begin work. A quote should give you everything about the project at hand. It should include what is in the installation cost as well as info about the hardwood flooring. It should outline exactly what they’ll be doing for you, and how much you’ll pay for the entire process. You can’t bring in hardwood floor and install it the same day. 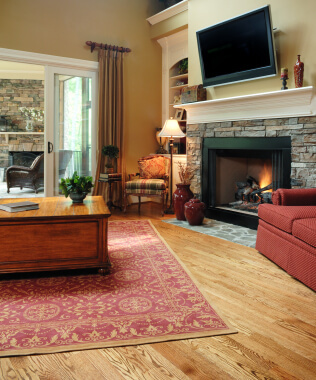 Solid hardwood flooring swells and contracts depending on the moisture content of your home. It is essential that your flooring contractor ensures that your wooden flooring is properly acclimated to its new environment before it is nailed into place. A reputable flooring company will take moisture content meter readings of the floor and subfloor long before they begin. It can take anywhere from a few days to a few weeks for your wood to acclimate to its new location. Before the first plank is laid into place, the subfloor needs to be thoroughly prepared. This means creating a clean, flat, dry surface area to begin. If the subfloor isn’t level, it can lead to bouncy or squeaky floor boards. Also ensure that your hardwood floor contractor uses materials appropriate for subflooring, for example, plywood rather than particleboard. If the hardwood installation team arrives and is nailing down your hardwood planks within minutes of arrival, you might have a reason to be concerned. A good installation team will plot out the layout of your entire area before they begin to ensure they don’t run into problems later. Not all rooms are perfectly square. Not all planks are cut in the same way. It’s also important that they factor in how to deal with hallways and stairs, or handle special considerations such as fireplaces, entryways, or landings. If hardwood isn’t fastened properly, you’ll inevitably have problems down the road. Not enough fasteners lead to moving noisy floorboards with gaps. There are many different approaches to installation, but in general, you should have at least two nails in every board, with a nail 1 to 3 inches from each board end. Each nail is 8 to 12 inches apart in traditional planks, with it being 6 to 8 inches for planks 4 inches or wider. And of course, it’s important to follow manufacturers guidelines. Are you ready to hire a pro to install your hardwood floors?